Okay, so maybe certain people, when they reach a certain age, aren’t too thrilled about birthdays. I know, my husband is one of those people. He thinks it’s very nice that people want to wish him a happy day, but he’d rather just ignore the whole thing! ‘Celebrating’ his birthday isn’t really in his vocabulary! On the other hand, even if someone doesn’t like to acknowledge the passing of another year, those of us who love them do want to at least give them a card; and what says it better than a handmade card? When you make a card yourself, a piece of you goes into it; because you’re thinking of who you are giving it to, and adding special touches that you know they will like. Last night I had a great time with 5 wonderful ladies creating some special cards! I thought I’d share a couple of them with you today. Unfortunately I was so busy having fun & helping out that I forgot to take pictures of the group while making their cards! So, you’ll have to settle for pictures of just the cards this time. Do you recognize the ‘doily’ underneath the sentiment? That’s right – it’s one of the Spiderweb Doilies from the last Holiday catalogue! When you flip them over, the back side is white, so you can get lots of use from them. You can also cut them down into different shapes, but I liked the full shape; I just cut the doily in half. The card base is the new Heavy Whisper White, and it’s layered with a piece of the Perfectly Artistic Designer Series Paper, that I got for FREE from the Sale-A-Bration catalogue! It has gorgeous marbling on the reverse side; this side is a beautiful watercolour wash. After attaching the 1/2 doily using the Fine Tip Glue, I added a strip of retired Watercolour Wonder Washi Tape with a gold stripe (available in the Clearance Rack! ), then a length of Gold Glimmer Ribbon, also retired from the past Holiday catalogue. 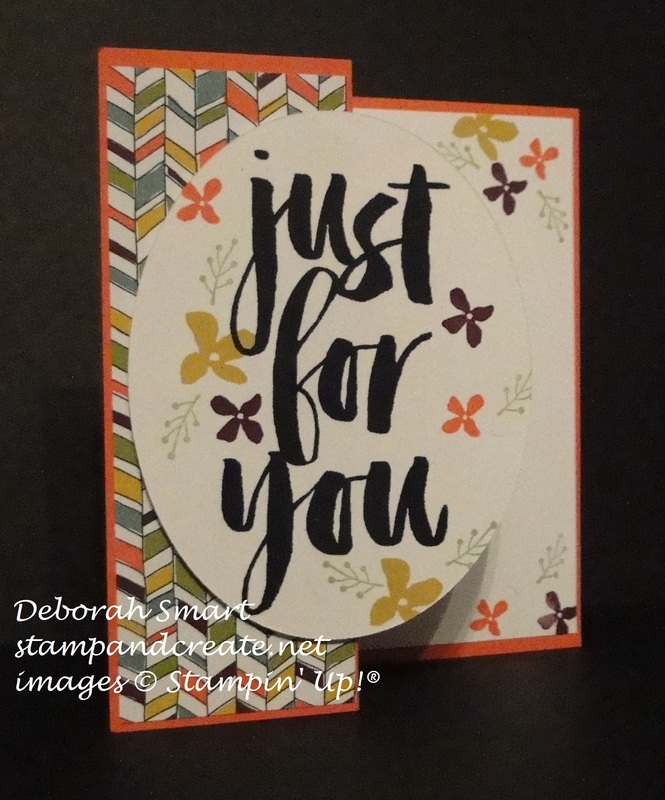 The sentiment is stamped in Tempting Turquoise onto Whisper White cardstock; the ‘To You’ is added in Melon Mambo ink. 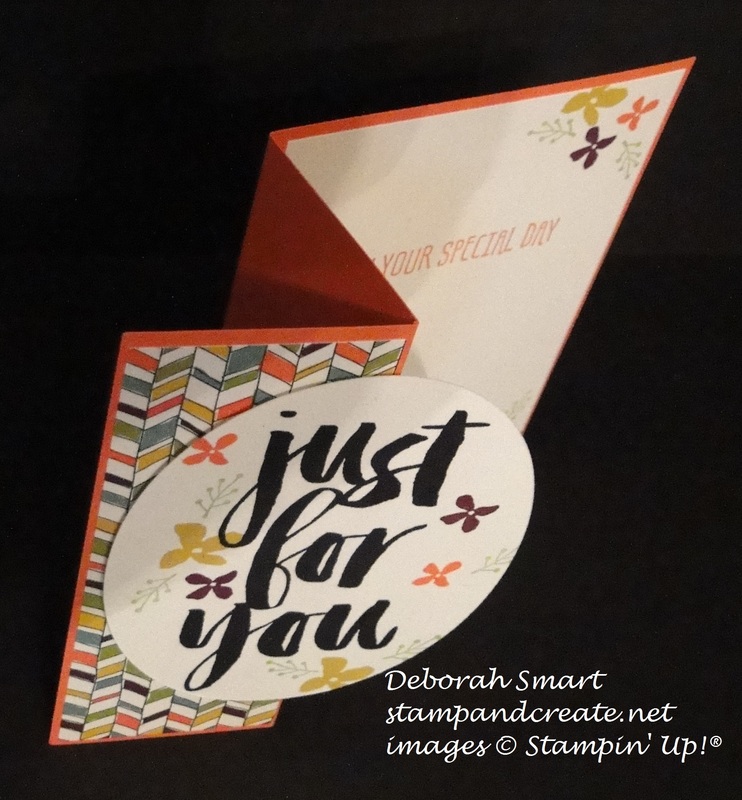 The stamp set is called Perfect Pairings – and I earned it for FREE as well!! I used the Chalk Talk Framelits to die cut the sentiment, and popped it up with Stampin’ Dimensionals after attaching some loops of Gold Thread behind it. A few scattered Rhinestone embellishments, and this card was done! 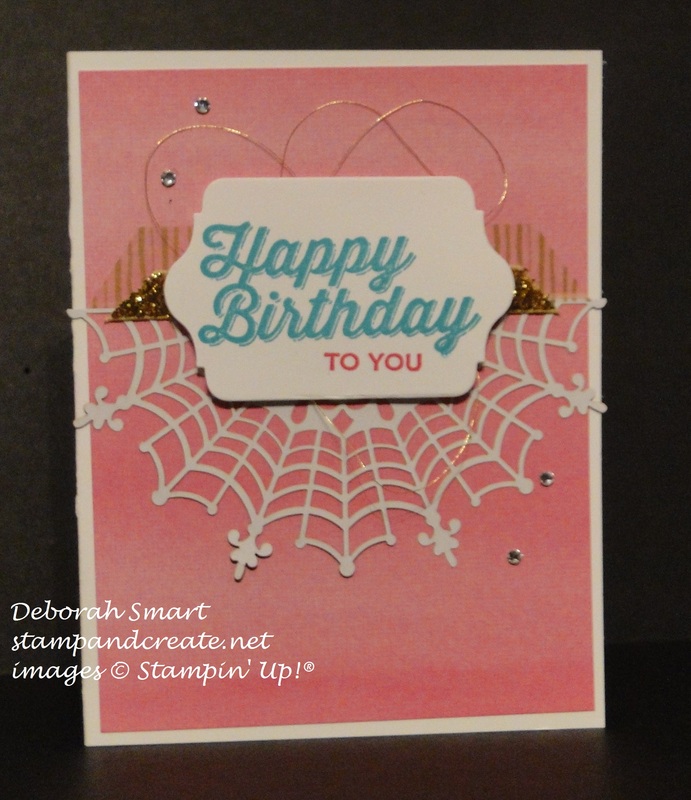 One of my ladies was able to ‘customize’ her card for a friend whose birthday is on Hallowe’en by using the black side of the spider web doily, and switching to Black in for stamping! This next card also uses a FREE set from Sale-A-Bration called Botanicals For You. I don’t usually go for large font-full card front stamp sets, but this one just caught my fancy – I think it’s the combination of the font used, the great little flowers in the set and the fun sentiments. We did a fun fold card for this one; it’s really easy to do! You start with a base of 8 1/2″ x 5 1/2″, score it at 2 1/8″ and 4 1/4″; fold normally on the 4 1/4″ score line, then fold backwards on the 2 1/8″ score line. Add your DSP, and decorate how you like! I’ll put a tutorial on my tutorials page later in the week. 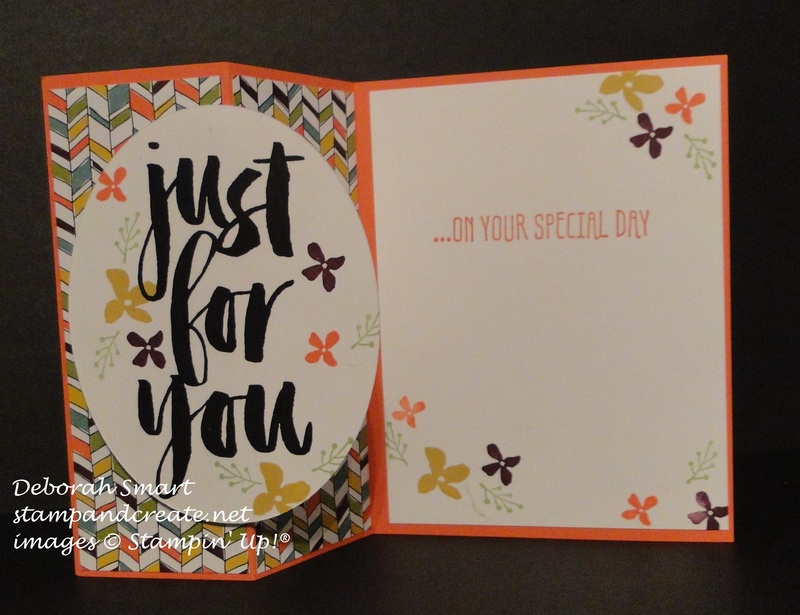 The card base is Calypso Coral cardstock, and it’s layered with more FREE goodies – the Wildflower Fields DSP from SAB! After layering the DSP onto the card base, I used the Ovals Framelits to cut the 2nd largest oval, stamped the sentiment in Archival Black ink, and added the flowers in Delightful Dijon, Blackberry Bliss and Calypso Coral; the leaves are stamped in Pear Pizzazz ink. The stamped oval is attached to the front panel by attaching Dimensionals only to the left side of the oval. That way, when the card is opened, you can still see the beautifully stamped front. As I said, it’s an easy fun fold that adds a little something different to your card, and a ‘wow’ for the recipient! If you’re interesting in earning these Sale-A-Bration items, and more, for FREE, contact me at debsmart@shaw.ca, or you can order online directly through my store – just click on my signature below! Previous Previous post: Party Pop-Up Fun!